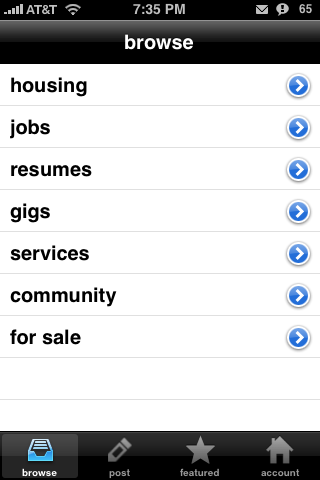 I’ve looked into a craigs list app for the iPhone before but the only one I could find cost $2.99. Gizmodo wrote about craigsphone today so I thought I’d check it out. The first thing that bugs me about this app is that you can’t view listings by their category in the for sale section. It’s all mixed together. You also have to be careful when you’re looking at an item and want to go back, you have to wait for the for sale button to load. Otherwise, if you do it too fast, the browse button is still there and it takes you all the way back to the first login screen.